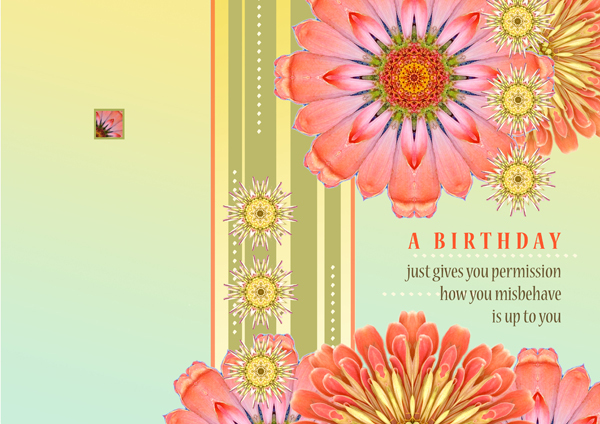 Another greeting card recently licensed to Calypso Cards for May release. The art was actually derived from an illustration I had in my first A Fearless Woman calendar - 2011. I've always loved the notion of permission to misbehave (legally, of course); to feel it, express it, let go. I remember a friend remarking to me once about a woman she had seen listening to music and dancing in the crowd at a local establishment - expressing such joy with her body. My friend said of this woman, "She just gives you permission!". Reminds me how we can do this for each other when we are shining, living in full bloom, with our bodies full of vitality and expression - feeling the electricity of joy. We pass it on, inspiring others and giving others permission. Too often, we seem to be looking to catch someone making a mistake, or catch someone not measuring up to the celebrity standards of attractiveness, or just not measuring up in some way. How about we start catching each other shining. Just a note: On my Fearless Woman blog, I've previewed a new illustration that will appear in the 2013 A Fearless Woman calendar. The post touches on some of the fascinating brain science on fear and anxiety..